Volkswagen has added equipment upgrades to the Tiguan and Tiguan Allspace, with the introduction of new Match and R-Line Tech specifications. Match trim replaces the SE and SE Nav trims, but also brings a rear view camera, park assist, keyless entry and 19-inch Victoria alloy wheels. This package, when factoring in a small price revision, equates to £1,130 of added value over the previous SE Nav spec, with the same engines and transmissions offered as the outgoing trims. 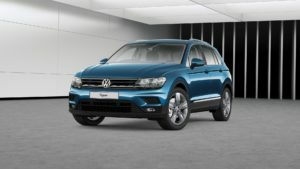 In diesel form the Tiguan Match starts from £29,780 with Volkswagen’s 148 bhp 2.0 TDI SCR engine, two-wheel drive and a manual gearbox, and the Tiguan Match range is topped by a 187 bhp 2.0-litre TDI SCR variant with 4MOTION all-wheel drive and a DSG gearbox, at £34,770. With the total value of these options being £1,330, a small price realignment of £200 over SE Nav examples represents over £1,100 of added value to these new Tiguan models. R-Line is also being replaced, by a new R-Line Tech trim. This specification now includes a £1,485 package of options comprising area view, Park Assist, Keyless entry and full electric tailgate operation. The same £200 price revision equates to an extra £1,285 of standard equipment now fitted to the already generously-appointed Tiguan R-Line, with prices starting at £33,150 for the 148 bhp 1.5-litre TSI EVO variant with a DSG gearbox, and £38,335 for the powerful new 227 bhp 2.0 TSI version, with more engines to follow. Product Manager Brian Luckie said: “The Tiguan is already a favourite with UK car buyers, being our third-best-selling model behind the Golf and Polo. This addition of over £1,000 of extra equipment and extra value only strengthens its case. Deliveries are expected to start later this month, for both Tiguan and Tiguan Allspace variants, in both Match and R-Line Tech trims.